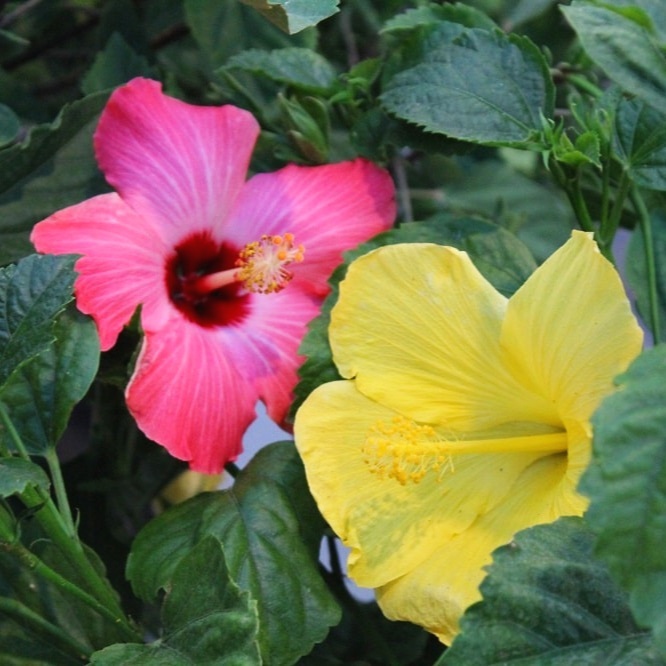 Hibiscus can be kept over the winter to enjoy year after year. Why overwinter tender plants? You can save money by “recycling” plants from year to year instead of purchasing new. Plus, many tropical plants get larger and bloom more profusely as they get older. Overwintering allows you to grow plants larger than are generally available for sale, giving you unique specimen plants that no one else will have! To overwinter tender plants, remember to bring them in before the first frost (except bulb forming types) but do let them experience some cold (it helps trigger dormancy). Two weeks before you plan on moving your tender plants indoors, move them to a shady location to get them used to lower light. At this time also check for insect pests and treat appropriately (Horticultural soap or oil, Organicide, or products containing acephate or pyrethrins will handle most pests-read and follow the label directions). If you find ants or centipedes in the soil, dunk the pot in a bucket of water with a few drops of dish soap added for 15 minutes to drown them. (lantana, hibiscus, angel’s trumpet, duranta, bougainvillea, etc.) use the dormant method to overwinter. Prune to a manageable size if needed, in most cases you can reduce by 1/2-2/3 of the plant’s height. Cut bananas almost to the ground (in pots). Force dormancy by keeping cool, dark, and reducing water until some leaves drop. Keep at a temp of 40-45F degrees. Warmer will encourage growth. OK if it nears freezing, but don’t let drop below 32F. Water only when top 2-3” of soil is dry, with just a bit of water (not enough to run through). If stems shrivel it’s not enough water. Do not fertilize at all. In spring repot and prune to shape if necessary. Feed with ½ strength fertilizer until leaves start to develop, then feed normally. You need really good light-south or west window. Treat like a house plant. Water as plant needs, keeping it on the dry side, and use minimal (if any) fertilizer. It will not be as pretty as in summer-but you just need to keep it alive until spring. Leaf drop-even substantial-is normal. Watch closely for insects-they will explode quickly if present. In spring prune off any weak winter growth and put your plant back outside after danger of frost (acclimate to full sun gradually if plant still has leaves). And/or-take cuttings of soft tropicals to root for next spring’s use. Insurance! Let frost kill back top growth/leaves. Dig up and brush soil off, avoid nicks or cuts (allows in rot pathogens). Allow to dry & store in a cool (not cold) dry place wrapped in newspaper or layered in damp sphagnum moss. They need ventilation in storage-stored too closed-up they can rot. Inspect regularly and discard at any sign of rot (can contaminate others). Citrus prefer non-dormant winters (grow as a houseplant) but can survive dormancy if you do it just right. Mandevilla can be overwintered using the dormant method. Dipladenia is best treated as houseplant. Dig up, leaving some leaves on. You can reduce root ball to a surprisingly manageable size! Wrap roots in trash bags or put in a pot.